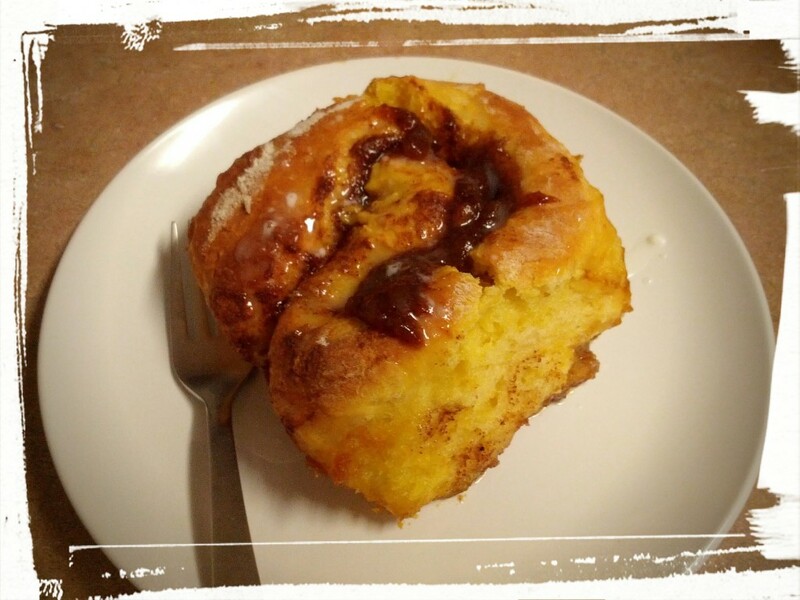 My breakfast this morning was a freshly baked Pumpkin Cinnamon Bun! I’ve been meaning to make a pumpkin version of the traditional sweet bun for a while now and I finally put it together last night, let it rise overnight, and baked it this morning. It’s not a Pumpkin Pie Cinnamon Bun, but I think it easily could be turned into one with the addition of some pumpkin pie spice. If you try it, let me know in the comments how it turned out! 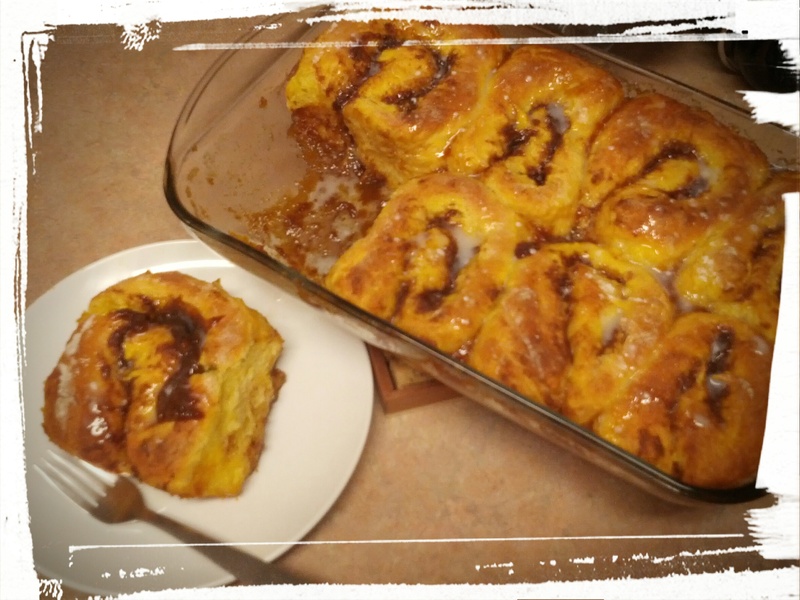 I’m pretty happy with this version: there’s cornstarch in the dough, which makes it extra light and fluffy, and there a pumpkin-caramel sauce in the base of the pan for that extra-sticky yumminess that makes a cinnamon bun so good! I will say that there is a lot of butter in this recipe, but it doesn’t taste overly buttery. 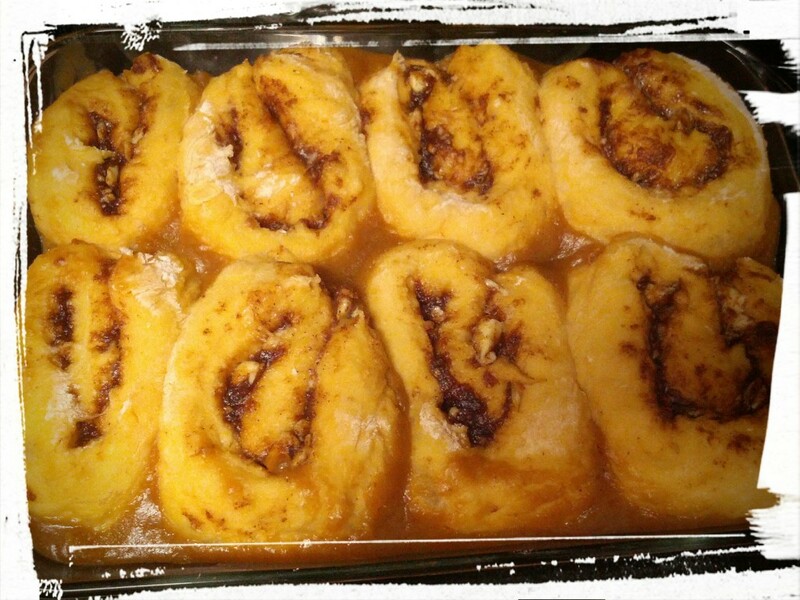 Want to make some fall-flavoured cinnamon buns yourself? Bake on! Mix all dry ingredients together in a mixer. Heat the milk and pumpkin puree in the microwave until warm but not hot and add to dry ingredients. Mix in eggs and soft butter. Let rise in a warm space for at least an hour. Then punch down and roll out on a floured surface. Mix all the filling ingredients together until it forms a spread. Spread over surface of dough. Roll up dough length-wise, and cut into slices. Place slices of rolled-up dough on the sauce, and let the buns rise for another hour or overnight. Bake in a 350 degree oven for about 20 minutes or until golden on top and cooked through. Drizzle with a mixture of icing sugar and milk while still warm. And bite into a nourishing and delicious cinnamon bun! Post-rising-in-the-pan, but pre-baking-in-the-oven. They’re puff-alicious! As I said above, I baked these last night. I pulled out my bowls and flour and spices at 11 pm because I couldn’t sleep and wanted to make something yummy. I do a lot of cooking in the evenings, I find. A decade (or two, to be honest) ago, I used to be a morning person. But these days I’m a night owl to end all night owls. I actually have an official sleeping disorder — two, to be exact. Initial Onset Insomnia as well as Sleep Phase Shift Disorder. Which is why you’ll often find that I post at night. But I like being alert in the evening hours. It gives me a chance to make delicious things for the next day. Speaking of which, I’m trying out something new tomorrow. Stay tuned! Plated and mere seconds away from being devoured by yours truly. Next Post: Parisian-Style Baking and an On-Line Baking Group. Plus cookies. And chocolate. Because chocolate! This entry was posted in Breakfast Foods, Desserts Not Otherwise Categorized on November 11, 2014 by Margaret. This looks delicious as does the chocolate/peppermint dessert you previously posted!